To a degree this gradual weakening of the bones is part of the aging process for all of us. Our bones are a complex framework of living tissue. The body constantly removes old bone cells and creates new ones, but as we get older this process slows down. From around the age of forty we all begin to lose some of our bone density. The term osteoporosis is used when the bones of individuals lose density to a very significant degree and they become particularly vulnerable to fractures. People with osteoporosis display few obvious symptoms. Often the first time the patient and his or her medical practitioner become aware of the possible onset of osteoporosis is after a slip or fall has resulted in a broken bone. However, a fractured bone in an older individual does not necessarily mean that the person has osteoporosis. But, with that possibility in mind, the medical practitioner will want to examine the nature of the fracture and a number of other factors. For instance, we instinctively put out our arms to break the fall should we slip when we’re walking or standing. For most of us our wrists will be sufficiently strong to withstand the impact of a fall from a standing height without serious injury. However, for those experiencing the onset of osteoporosis, such a fall frequently results in a broken wrist. Osteoporosis is a condition generally associated with aging. However, there are a number of other risk factors that should be taken into consideration when considering the possibility of the onset of the condition. These factors include other health issues, medication, lifestyle and genetic factors. Osteoporosis is a condition which develops gradually over many years without there being any obvious symptoms. The first time many people will become aware of the onset of the disease will be when they sustain a fracture from a relatively minor fall. This kind of broken bone is called a fragility fracture. Such an injury in an older person is potentially very serious because it can affect that person’s mobility and can have implications for their ability to live independently. In cases where the onset of osteoporosis is suspected, the doctor will generally send the patient for a specialist scan known as a dual energy x-ray absorptiometry (DEXA) scan. From the patient’s point of view, this is a fairly straightforward, non-invasive procedure. It takes ten to twenty minutes, you will remain dressed and the x-ray dose is relatively low. The DEXA scan measures bone mineral density (BMD). This establishes whether or not bone mineral density has deteriorated to the point where the patient is at risk of fragility fractures. Once osteoporosis has been diagnosed, the patient and his or her medical practitioner can consider in what ways the condition can be treated and managed. The three principal routes for treating osteoporosis are medication, hormone treatment and lifestyle changes. If you are diagnosed with osteoporosis, your specialist will assess your circumstances and advise which treatment, or combination of treatments, is appropriate. Medication – There is a wide range of drugs approved for the treatment of osteoporosis. The aim of all of them is to reduce the risk of fractures by strengthening the patient’s bones. The most commonly used drug is bisphosphonate. This can be issued in tablet-form or administered by drip in hospital. All the various brand names of bisphosphonates act by reducing the severity of deterioration in bone strength. However, bisphosphonates can have significant side-effects, particularly for people with problems of the gullet, digestive system or kidneys. Other drugs used in the UK include strontium ranelate, denosumab and raloxifene. Hormone treatment – Hormone replacement treatments are designed to reduce some of the deterioration in bone density caused by low oestrogen in women and low testosterone in men. Hormones prescribed can include calcitonin, teriparatide and parathyroid, as well as HRT to replace reduced levels of oestrogen or testosterone. Lifestyle changes – The deterioration of strength in one’s bones can be moderated by a number of important changes to one’s lifestyle. The key areas to address are stopping smoking, reducing one’s alcohol intake, taking regular weight-bearing exercise and eating a varied diet and in particular one which includes plenty of calcium and vitamin D. While some people may find these lifestyle modifications very challenging, there is no doubt such changes will also improve their general well-being, as well as the health of their bones. Another area of lifestyle management for those affected by osteoporosis is to examine the hazards in the patient’s physical environment, in particular his or her home, and look for ways to reduce the risk of trips and falls that might result in a fracture. This process might include changing the physical layout of the home and introducing selected assistive devices, such as stairlifts. Whilst there is no complete cure for osteoporosis, the previous section of this article highlighted a number of treatments which can slow down and even partially reverse the progress of the disease. However, while continuing to look for ways to treat osteoporosis as a clinical condition, it is important to remember that those living with the condition are individual people, the vast majority of whom want to be able to continue living their normal, independent lives. Information – For osteoporosis patients to take control of the daily management of their own condition, it is important that they have the right information to help them do so. Most GP surgeries and hospital specialist departments have a range of useful leaflets giving information on coping strategies. The National Osteoporosis Society has a central helpline available on weekdays where people living with the condition can speak to qualified nurses. The Society also hosts an online discussion forum where patients, their families and carers can discuss issues of mutual concern and offer each other support. Support groups – There are a number of local osteoporosis support groups up and down the country. The groups are supported by the National Osteoporosis Society and are run by and for people living with the condition. Local groups offer support, advice and the chance to meet and talk with fellow osteoporosis patients. Pain relief – Pain relief is extremely important; whilst a broken bone will heal within a few weeks, the pain caused by the fracture can often last much longer. Living with untreated pain drags the sufferer down and seriously undermines their general well-being. Over the counter painkillers may help, or in more severe cases one may need to ask one’s doctor for appropriate prescription medication or a referral to a pain clinic. Non-medication routes for dealing with pain include hydrotherapy, transcutaneous electrical nerve stimulation (TENS) and physiotherapy. Some patients find that complementary therapies can help. Healthy lifestyle – An important part of leading a healthy lifestyle is to engage in regular exercise. The form of exercise one takes depends on individual preferences, but it should include some-weight bearing element and movement designed to maintain muscular-skeletal strength and flexibility. Walking, swimming, golf, pilates, bowls and t’ai chi are all ideal. However, high impact sports, such as running and squash, pose too much of a risk of fractures and should be avoided, unless your doctor specifically advises otherwise. To complement regular exercise, one should also aim to maintain a healthy diet. Dietary supplements may be necessary if one is not obtaining sufficient calcium through one’s food intake, but do not commence on a regular course of supplements without speaking to one’s doctor first as too much calcium can cause kidney problems. Falls are a major concern for older people, and in particular for the high percentage of this demographic group who are subject to osteoporosis. Around fifty per cent of UK women aged over fifty and twenty per cent of men in the same age group will suffer an osteoporosis-related fracture during the remaining years of their life. Osteoporosis places huge demands on the NHS: treating hip fractures currently costs the nation £1.7 billion a year. With demographic changes this figure is set to rise year on year. All of this has major implications for Britain’s health and social care budget. At an individual level, the cost of falls among the elderly population is even more distressing. Injuries from falls are a major cause of long-term disability amongst older people and, for those over seventy-five, injuries resulting from falls are the single most frequent cause of accidental death. Loss of mobility – Which not only leads to a decline in general physical well-being due to a lack of exercise, but can also result in greater social isolation and depression. Loss of confidence – Breaking a bone in a fall can be a terrible shock to an older person. The fear of sustaining a further injury can lead to anxiety about engaging in any form of physical activity, loss of self-confidence and reduced self-esteem. Loss of independence – The effects of an injury and anxiety about suffering another one can result in the older person becoming more dependent on those around them. In many cases this can lead to the older person having to move from their own home into some form of care. Related health issues – Many older people recovering from fragility fractures experience further complications from infections, which in some cases are hospital-acquired, and from pressure sores when they are subjected to a prolonged period of immobility. Hypothermia – Older people who become immobile after an injury from a fall are more vulnerable to hypothermia than their more active counterparts. With a little foresight and planning, these are all risks that can be dealt with. Clearly, any national strategy for dealing with osteoporosis has to address more than just the disease itself and look at the ways older people living with the condition can be helped to live safe, independent lives in their own community and, preferably, in their own home. On the subject of the best place for older people to live, the Government, Local Government, the NHS and organisations representing older people themselves all speak with one voice: older people want to be able to remain in their own homes and live independently for as long as possible. To support this objective of promoting independence, a number of adaptations and assistive devices are now on the market. These devices are designed to help older people affected by conditions such as osteoporosis to continue to lead safe, fulfilling lives in their own home. Medical walkers and walking canes – These devices can give the assurance of greater stability to those who have a condition which causes them to be unsteady on their feet. Walkers and canes are suitable for use in the home and outside, though a cane is a little more flexible and versatile than a walker in the types of settings in which it can be used. Handrails – Handrails are relatively straightforward to fit and can be made reasonably unobtrusive, but they can make a major difference to an older person’s ability to get about his or her home. In the bathroom and wherever there is a step are the most common locations for placing a handrail. Walk-in showers – For a person whose mobility is limited, a conventional bath or shower presents a major challenge. If that person also has osteoporosis, the risk of serious injury from any resulting fall is increased. Installing a walk-in shower in the existing bathroom, or converting it to a wet-room, is a sensible adaptation which is also suitable for use by other family members or guests. Hip protectors, neck collars and back braces – Hip protectors are padded devices which can be worn as a belt or incorporated into underwear. The idea is to protect the wearer’s hip bones from some of the impact of a fall or slip. Neck collars and back braces are designed to support and stabilise the neck or back of osteoporosis patients who have previously sustained injuries to the vertebrae. Reaching aids – The are a range of devices on the market which help a person who is unsteady on his or her feet to reach for an item safely, without stretching or over-balancing. Seat lifts – Some osteoporosis patients struggle with getting onto their feet from a chair, which can often put them at risk of a fall. A seat lift helps the individual raise him or herself from a sitting position, gradually and steadily, up to a standing position. Wheelchairs and electric buggies – For osteoporosis patients whose symptoms preclude walking for any distance, a wheelchair or electric buggy can provide the lifeline which allows that person to go out from their home, do some shopping, or visit friends and family. Stair lifts – Negotiating the stairs in one’s home presents a particular risk point for older people who are vulnerable to slips and falls. Not only are stairs difficult to manoeuvre for people with restricted mobility, but the potential severity of any injury sustained is much greater than that which would result from a fall on a level surface. 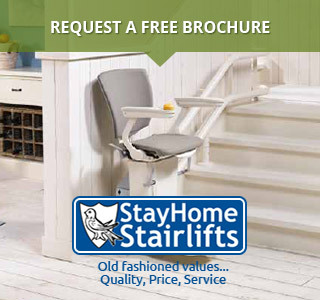 Stair lifts offer the older person a means of getting safely up and down stairs independently. Whilst installing a stair lift is without doubt a significant cost, it is an investment which can make the difference between a person being able to continue living independently in their own home or having to consider moving into residential care. How can stair lifts help those with Osteoporosis? Not every osteoporosis patient wants to move into a bungalow. People tend to like their own house and garden, they enjoy living near friends and familiar locations. Furthermore, osteoporosis patients generally do not exist in isolation; they have to consider the needs of other members of their household, or of children or grandchildren who may wish to visit. A bungalow, therefore, may not be a practical proposition. A stair lift, together with an appropriate selection of other assistive devices, can help make it possible for a person with osteoporosis to continue living in their own home, and to enjoy safe access to the upper floor. This not only helps the individual be protected from trips and falls, but promotes their all-round physical and mental well-being by remaining close to family, friends and their community. Straight stair lift – A straight stair lift, as the name implies, is designed for the home that has a single straight flight of stairs. The lift is electrically operated and the passenger sits on a seat resting his or her feet on a foot-rest. Where the home has more than one straight flight of stairs, because of an additional floor or mezzanine, more than one of this type of straight stair lift may be used. Curved stair lift – Where the stairs in one’s home have a curve or a turn, a curved stair lift is the appropriate choice. Again, this type of lift is electrically operated and has a seat and foot-rest. Perch stair lift – A perch chair lift is designed to meet the needs of a person who has difficulty in bending his or her knees and cannot easily sit on the seat used on other types of stair lift. The passenger stands or ‘perches’ on the platform of the lift. Perch stair lifts also have the advantage of being somewhat narrower than stair lifts upon which one sits. This makes them more suitable for the narrower staircase. Outside stair lift – Outside stair lifts are very similar in design to those used indoors. However, to stand up to the rigours of the weather, they are built to be water-proof and more durable. Outdoor stair lifts are most commonly used to access an entrance door at the top of some steps or to reach the garden from a different level. Fitting a stair lift generally takes around half a day. They are fitted to the existing stair, rather than the wall, and are set to travel at normal walking pace. Depending on your circumstances, some form of grant may sometimes be available from your local authority. Osteoporosis, then, is a weakening of the bones in older people that can frequently lead to fragility fractures. The process of decline in bone density is something which affects everyone from middle-age onwards, but the effects are more pronounced in some than others. A person’s proclivity towards osteoporosis is affected by genes, lifestyle and the influence of other health conditions or medication. Osteoporosis is a major health concern throughout the world and its impact will increase as human longevity rises. This has major implications for health and social care budgets. For the individuals whom it affects, osteoporosis can be a particularly debilitating condition which can lead to long-term disability and a loss of one’s independence. However, there are a number of medical interventions and lifestyle changes which can slow the progress of the disease and reduce the effects of its symptoms. As well as clinical interventions, many people living with osteoporosis find that adaptations to their home and the use of assistive devices helps them to continue living independently in their own, familiar setting. One key assistive device is the stair lift. This provides a means by which people with osteoporosis can continue living in their own house with full access to all parts of it. Whilst there is not yet a cure for osteoporosis, stair lifts and other assistive devices offer the person with osteoporosis a safe, reassuring way to continue living independently in their own home. Advice and tips about living with Osteoporosis and the daily struggles that might bring. Includes some useful resources on the topic. A nice article on MSN about some of the myths that surround the condition of Osteoporosis and successfully debunks a lot of them. Guide on the condition from the NHS Choices website, a pretty definitive guide outlining the condition including: Symptoms, causes, diagnosis and treatments. A really well written article from Bedford borough council outlining the risks of Osteoporosis, includes lots of facts , figures and graphs. Handy list of support groups and events for those with Osteoporosis in your local area. Handy guide on nutritional ideas for those suffering from Osteoporosis. Includes good dietary advice and articles. Interesting site about the prevention of falling. Includes articles, tip and advice. Article on the various mobility, safety and assistive devices available for those with Osteoporosis. Our article on how to obtain a disable facilities grant for stair lifts. Lists most of the individual councils to make it easier to apply.